The British amphibious vessel HMS Albion became involved  in a minor confrontation with a Chinese frigate and two PLAN helicopters near the Paracel Islands in the South China Sea late last month. China views all international activity in the South China Sea as an infringement of its sovereignty, as demonstrated by its sharp reaction  to the British naval foray. Two Chinese frigates tailed the Japanese helicopter carrier  Kaga as it navigated the South China Sea last week. In contrast, the US didn’t object  to Chinese navy ships sailing within 12 nautical miles of the Aleutian Islands off Alaska, calling it a ‘legal transit’. Australian, New Zealand, French and US forces conducted a maritime surveillance operation  in the seas surrounding New Zealand’s northern exclusive economic zone. These countries are members of the Quadrilateral Defence Coordination Group and run joint patrol exercises to help Pacific island states conserve their natural resources , particularly fisheries. Australia contributes to the multinational exercise as part of Operation Solania . Russia’s latest Rubin-class border patrol vessel, Bezuprechnyy, has broken down due to problems  with its Chinese-manufactured diesel engines. EU sanctions have forced the Russian shipbuilding industry to depend on less reliable Chinese pumps and diesel engines . Last year, a Russian anti-sabotage boat also broke down  due to similar problems. India and the US are yet to resolve  questions over New Delhi’s plans to purchase five Russian S-400 Triumf air defence systems, despite hopes that they’d deal with the issue during last week’s first-ever India–US 2+2 dialogue. The talks did, however, result in agreements for information-sharing and defence cooperation. In June, the Indian government announced that it would continue  with the estimated US$6 billion procurement for the surface-to-air missiles despite the possibility of US sanctions. The contract is expected to be signed in October. Last week the Royal Australian Air Force and the Indonesian Air Force participated in Exercise Rajawali Ausindo 18  in Indonesia. The bilateral exercise involves C-130J Hercules aircraft and tests both air forces’ ability to provide humanitarian assistance and disaster relief. The RAAF was also scheduled to take part in Bushido Guardian 18 , its first bilateral exercise with Japan’s Air Self-Defense Force, but the event was postponed  because of the recent earthquakes in Japan. Boeing’s aerial refuelling tanker program reached a new milestone  after the US Federal Aviation Administration granted the KC-46 Pegasus a supplemental type certificate. The aircraft is now fully certified by the FAA, three years after it commenced testing , though it still requires a military type certificate from the US Air Force. The first delivery to the USAF is scheduled for October. The US military has earmarked US$2 billion for artificial intelligence research  that will focus on developing a new level of machine learning. The Defense Advanced Research Project Agency will run the program, which is aiming to transform computers from tools to ‘partners in problem-solving’. The agency will explore how machines can be taught to recognise new situations and adapt to them. 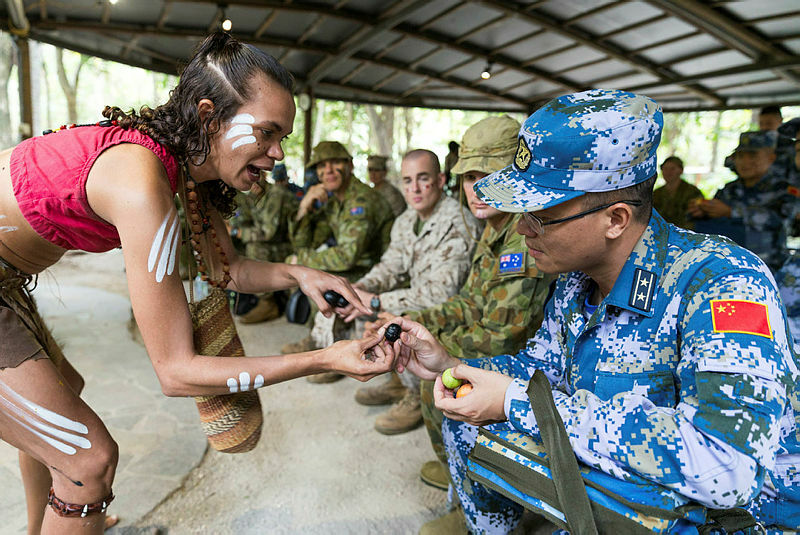 Troops from Australia, China and the US came together for a trilateral exercise  in Queensland’s Daly River region that was designed to promote cooperation  among the three countries. The exercise focused on survival skills and was led by experts from Australia’s NORFORCE regiment. The 30 soldiers and marines involved were taught how to start fires, purify water, navigate by the stars and hunt wild animals. German-based Rheinmetall has been awarded a contract worth €430 million  to supply the ADF with more than a thousand military trucks and modules. The Australian government has given the go-ahead for the procurement stage of the LAND 121 Phase 5B  project. Following on from last week’s update , Russian authorities now suspect that the hole discovered in a spacecraft attached to the International Space Station may have been made deliberately . Considering that the ISS is one of the last remaining joint projects between Moscow and Washington, an act of sabotage could have major repercussions . Russia’s Roscosmos space agency is investigating all possible causes. Canada and the US have affirmed their hopes for continued cooperation on joint space programs, despite ongoing trade and political disputes . Framing the cooperation as necessary in an era of new global challenges, Scott Pace, the executive secretary of the National Space Council, emphasised that the two countries’ mutual interests in space  remain strong. The Ethiopian Space Science Society  (ESSS) is advocating for greater attention on space science. Beza Tesfaye, ESSS’s general manager and coordinator of its programs in branches and schools across the country, is educating the public on the broad scope of space research. The focus on space may seem out of step with Ethiopia’s emphasis on its agricultural sector, but Tesafye notes that, ‘In order to have good agricultural products, you need to have the right data.’ Information on rainfall and weather patterns collected by Ethopia’s observatory, for example, is being used by the country’s farmers. The Department of Defence has chosen Elbit Systems of Australia to provide a cybersecurity training platform to the ADF. Cyber training ranges will be installed in facilities in Melbourne, Sydney, Adelaide and Canberra to teach students to identify cyberattacks and respond appropriately. The initiative is part of Defence’s accelerated defensive cyber training program  and the wider push to improve training and capability in the cyber domain set out in the 2016 defence white paper. The FBI has charged a North Korean computer programmer , alleging he was involved in some of the biggest cyberattacks in recent years, including the 2017 WannaCry attack, and was acting for the North Korean government. The charges were filed in June but remained sealed  until last Wednesday. The US government has denied that the sealing was due to the US–North Korea summit. The programmer, who is believed to be in North Korea, is the first North Korean national  to be charged with cyber offences. China has established a court  in Beijing to deal with intellectual property and internet-related cases. The Beijing Internet Court has jurisdiction over disputes about online shopping, service contracts, lending and copyright. The system was modeled on the first internet court  launched in Hangzhou in August 2017, which has heard 11,000 cases since its establishment. Aakriti Bachhawat, Rebecca Moore, Aru Kok and Georgia Grice are research interns at ASPI. Image courtesy of the Department of Defence.